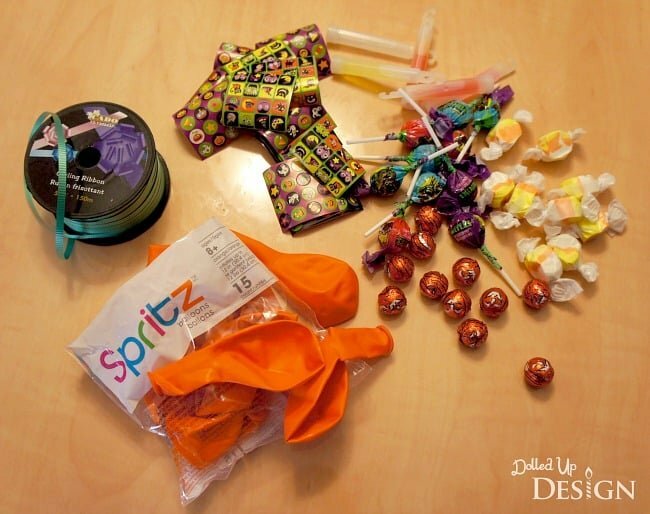 This post is courtesy of our contributor Chantelle of Dolled Up Design…Today I am sharing a fun idea that could be used for favors at a Halloween party or as a treat to share with your child’s friends and classmates. 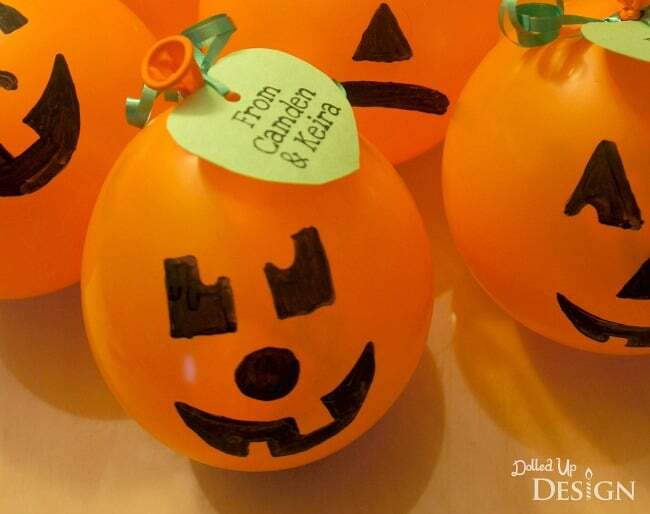 These adorable treat filled pumpkin balloons are inexpensive and easy to create, and can be filled with a variety of candy and non-candy treats. 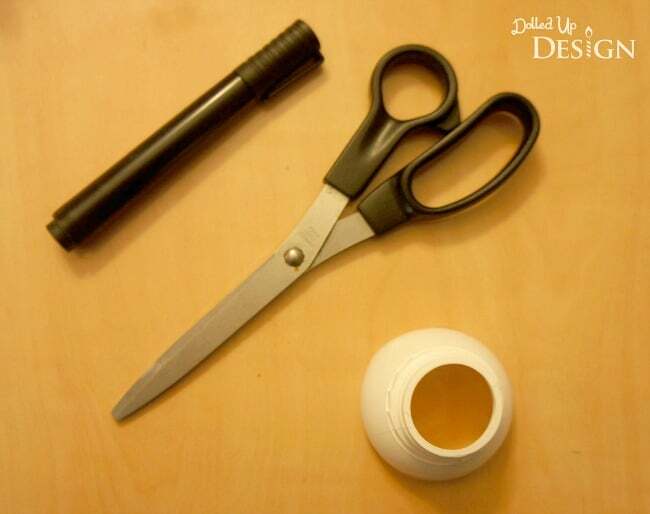 Begin by cutting off the top portion of your plastic bottle. 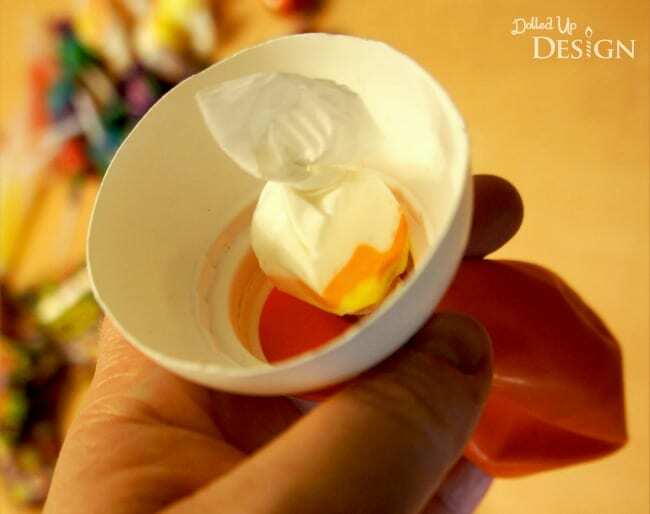 This will serve as your funnel to help get the treats into the balloons. Carefully stretch the end of a balloon around the top part of the bottle and carefully push the treats into the balloon. Repeat until all balloons are filled. Inflate each balloon and tie off the ends. I wanted to keep my pumpkin balloons fairly small so I didn’t fully inflate the balloons. 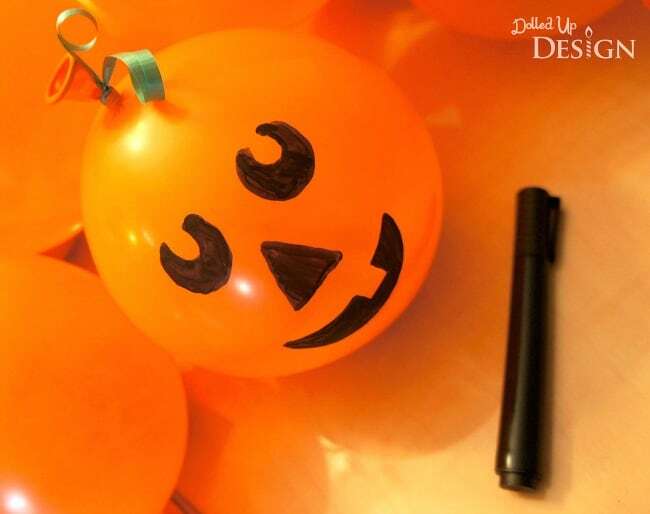 Draw a jack-o-lantern face on each pumpkin using a black permanent marker. Finish off your pumpkins by tying a green ribbon around the top of the balloon and attaching a leaf shaped tag cut from green construction paper. These pumpkins look great on their own or in a big patch. 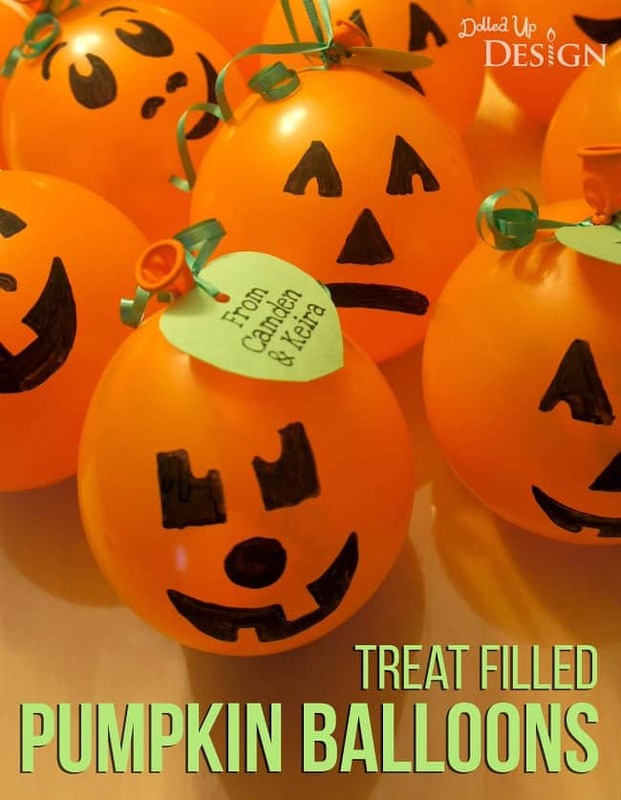 The kids I made these for were excited to each pick out their own jack-o-lantern and they couldn’t wait to pop their balloons and see what was in the personal pumpkin piñata. 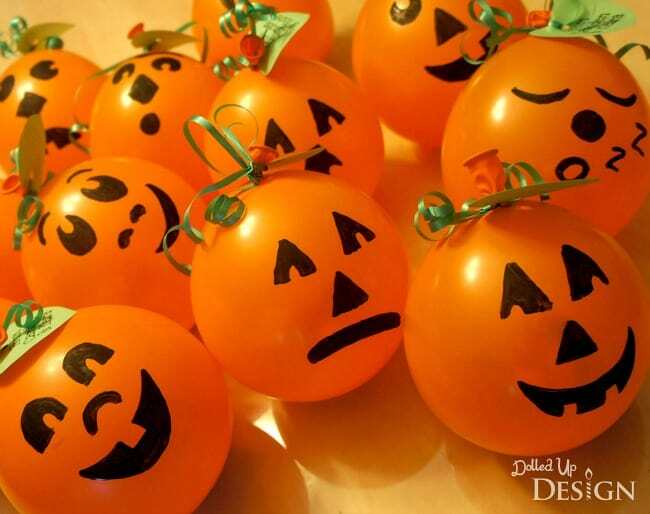 This activity does require adult assistance, but it is definitely something the kids can be involved in with stuffing the balloons and drawing on the jack-o-lantern faces. We’d like to send a big THANK YOU to Chantelle for sharing this super cute idea with us. Her parties are always easy to recreate and kids love them! Be sure to follow her on Facebook to stay updated on all her fabulous ideas. 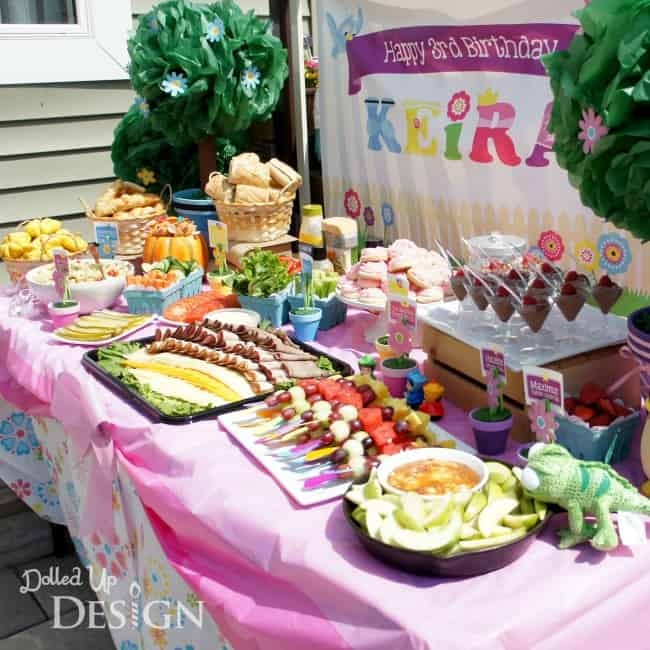 Check out this super cute Princess Garden Party she planned for her daughter! This is such a fun idea! I’ve already been brainstorming all of the fun things that would fit inside the balloon. It would also make such a fun pumpkin patch at a Halloween party. Thanks for sharing! This could work for Booing the neighbors! What a cute idea! Thank you!